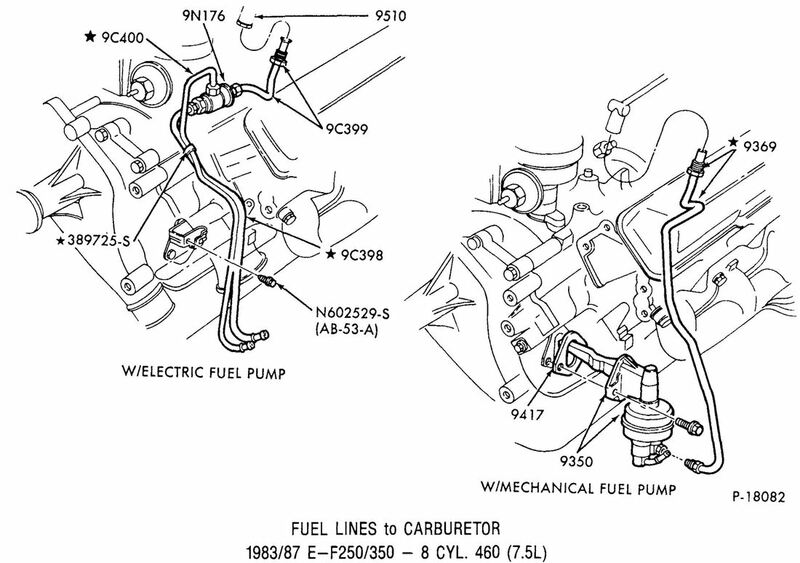 Overview of the fuel systems used on 1980 - 86 Ford trucks with 460 engines. When Ford introduced the 460 engine in 1983 it started a litany of progressive changes on the fuel systems for the trucks, including the fuel pumps, the wiring, and a hot-fuel handling system they created to prevent vapor lock. This page is to document those changes so you can figure out what you have and if it could be upgraded. F-Series with Pickup Box Removal Program, Trailer Towing/Camper Package or Special High Altitude Performance Package. Econoline (except below) with Heavy-Duty Service Package, Trailer Towing Package, RV Converter Package or Special High Altitude Performance Package. The electrical wiring for the 460's fuel system had two parts - the fuel gauge wiring, which included the tank selector valve, and the electric fuel pump control, if so equipped. 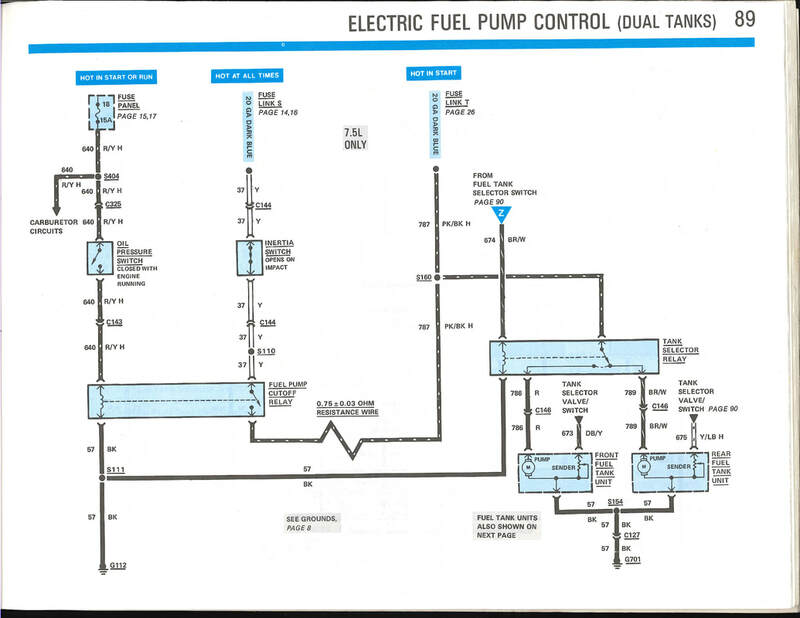 Electric Pump: Those trucks with dual tanks or an electric fuel pump got the more complex switch and 6-port selector valve shown on Page 96. Running: When the engine was running the pump was supplied reduced voltage via the fuel pump cutoff relay and the ~.75 ohm resistor. However, voltage to the relay was supplied through the inertia switch that would open on impact, thereby shutting the pump off in case of an accident. And, the relay was pulled in buy current to it from the oil pressure switch, which is closed by oil pressure from the engine. The hot-fuel handling system was installed on some 460-equipped trucks with an electric fuel pump, and consisted of a fuel vapor separator and a return fuel line to the tank. The separator housed an orifice of .040", .060", or .090" depending on the specifications of the truck. The orifice allowed fuel vapor and a small amount of fuel to return to the tank, thereby preventing vapor lock and keeping cooler fuel at the carb via circulation. 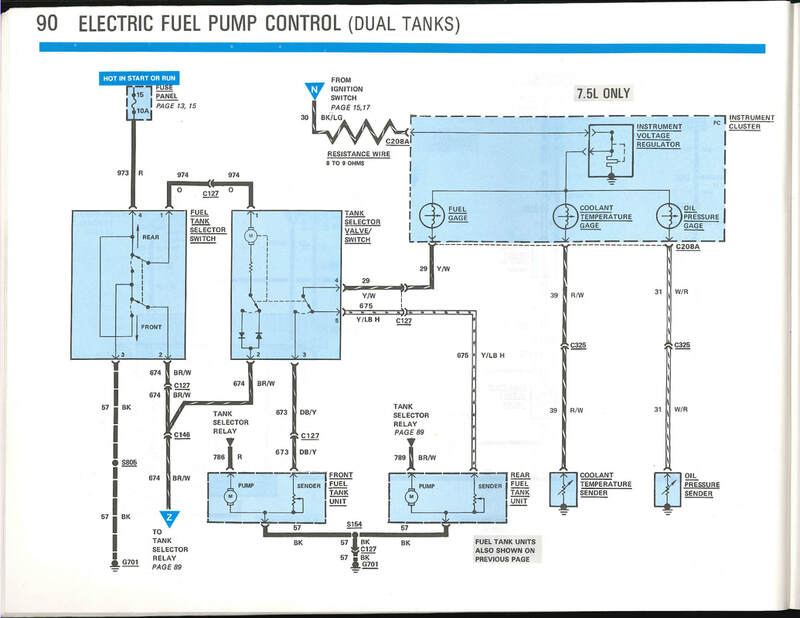 According to Bill Vose: "The rule I heard was two fold, A/C and hot climate areas for the hot fuel handling package. I am reasonably certain ambulance chassis models got the hot fuel package. Non-A/C and cooler climates received a mechanical fuel pump. 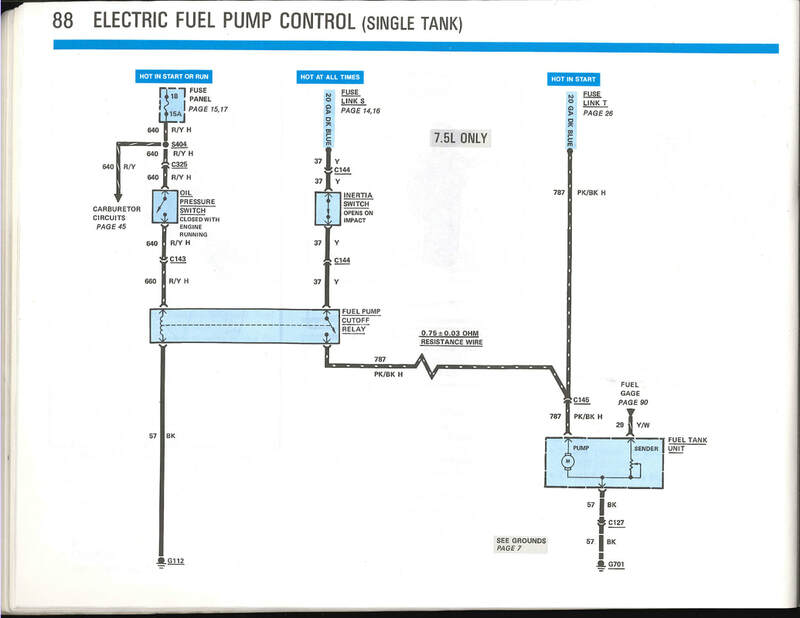 FWIW, all the 460s through 1987 had provision for a mechanical pump, if the hot fuel package was installed, then a block-off plate with a bracket for the fuel lines was installed in place of the pump."